Stay active with a new Tai Chi Fit workout every day. 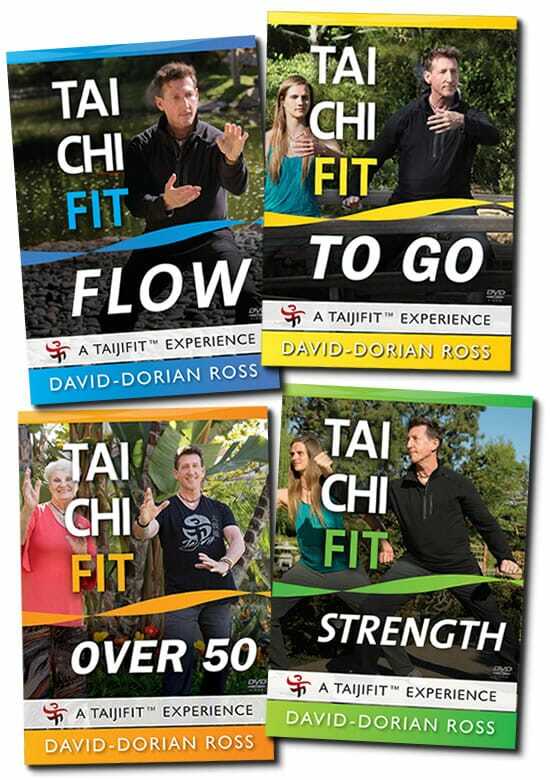 Collect the Tai Chi Fit DVD series from David-Dorian Ross. Includes all four DVDs, Tai Chi Fit: FLOW, STRENGTH, TO GO, and OVER 50. These workout videos use simple Tai Chi moves to get you into the flow, and get an energizing workout. In Tai Chi Fit – FLOW, David-Dorian gently guides you through a simple Tai Chi workout with an emphasis on continuity, connection, and your feeling of FLOW. The moves are shown in mirror-view, repeated to the left and right before a simple transition takes you to the next step. The FLOW workout meets the needs of a variety of different students. First, this is the absolute best starting place for tai chi beginners who just want to experience the moves and the deep feeling of tai chi for the first time. Tai Chi Fit - FLOW is also an excellent form of tai chi for seniors, as well as those with common medical conditions such as Parkinson’s, fibromyalgia, peripheral neuropathy, hemophilia, diabetes, or obesity. Mirror-view tai chi moves to the left and right. The FLOW workout is a perfect way to begin a tai chi practice without the stress of memorizing a form. Just follow along! It is also a great way for experienced tai chi practitioners to drill on the movements, and practice the often-overlooked tai chi principle of "continuity without interruption”. Master-Teacher David-Dorian Ross guides you through his invigorating STRENGTH workout, alternating between empty-hand and weighted tai chi ball movements. This routine gradually strengthens the entire body, increases your bone density, and boosts your cardiovascular performance. The STRENGTH workout combines tai chi, qigong and yoga to improve your qi (energy) circulation and your physical endurance. You will learn empowering fundamental tai chi moves while staying relaxed and focused. Tai Chi Fit – STRENGTH is excellent for those who need low-impact, whole-body exercise, such as those with back pain or in need of core-strengthening. Flowing tai chi, qigong and yoga moves. A mirror-view workout for beginners. Nothing to memorize; just follow along. In Tai Chi Fit: TO GO, David-Dorian helps you to find time for your tai chi practice with three different 20-minute workouts. The moves are shown in mirror-view, repeated to the left and right before a simple transition takes you to the next step. What if you only have a short time for your tai chi workout? What if you only have limited space? The Tai Chi Fit: TO GO workouts are portable, "pocket-sized" sequences that you can do anytime, anywhere. These short sequences are perfect for the commuter, the traveler, the busy Mom or Dad - and especially good for the workplace (try a Tai Chi Fit break instead of coffee)! The three TO GO workouts are a great way to get tai chi practice without the stress of memorizing a form. Just follow along! This program is perfect for beginners and experienced tai chi practitioners wanting some relaxing exercise and a few moments of tranquility during your day. In Tai Chi Fit: OVER 50, Master-Teacher David-Dorian Ross leads you through a simple tai chi lesson. Perfect for any age, this follow-along routine is shown in a mirror-view format with nothing to memorize. Just follow along, and you’ll enjoy the health benefits of tai chi, including improved mobility, balance, strength and flexibility. Perfect for seniors, those with limited mobility, or anyone looking for some gentle exercise, the OVER 50 workout combines basic tai chi moves and energizing qigong exercises for an easy, whole-body workout. You’ll be relaxed and breathing deep in no time. Tai Chi Fit: OVER 50 allows anyone to experience the wonderful feeling and benefits of tai chi without the stress of needing to memorize the movements. Just follow along, have fun, and keep smiling!